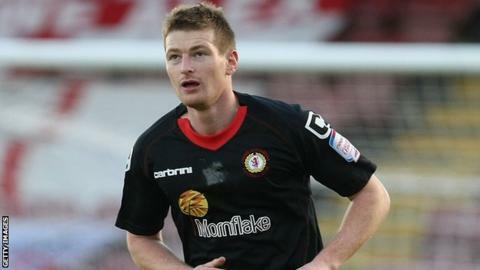 Crewe substitute Billy Waters' 84th-minute corner was only half cleared. And big centre-half Dugdale, whose goal on the final day of last season helped keep Crewe up, latched onto a loose ball to blast in left-footed from close range. The Alex's first clean sheet in League One still keeps them bottom. Walsall drop into the bottom four after three games without a win. Dugdale's late strike meant that Crewe scored at the away end at Bescot for the fifth visit running - to send the 438 travelling Alex fans into rapture. Mathieu Manset shot left footed just across the face and Jordan Cook's impudent 20-yard chip was tipped over by Crewe keeper Ben Garratt, while Romaine Sawyers whistled one just wide in the first half. But Crewe had the better early chances, Brad Inman lobbing just wide while Alan Tate saw a header fly just over from George Cooper's corner and Anthony Grant's right-foot angled shot went straight at the keeper. And former Walsall striker Febian Brandy's well-struck right foot shot was safely caught by Richard O'Donnell, only for the Saddlers keeper to almost clumsily spill it through his own legs. "I don't think we deserved to lose, but I don't think we did enough to win. "It was like a chess match. Neither team were creating much and they've nicked it at the end from a corner which we should have cleared. "We've missed Tom Bradshaw up front, but we've not played well in every match that he has missed. "Paul Downing and James Baxendale were suffering from a sickness bug that has swept our training ground." "It was not a great spectacle. A game of few chances, but we just nicked it and deserved to win. "It's lovely to have followed up last week's win with another victory. "We've got a good record here. We felt good about today. "They've had some good results here. They drew with Bristol City, so to come here and win is a real plus." Match ends, Walsall 0, Crewe Alexandra 1. Second Half ends, Walsall 0, Crewe Alexandra 1. Substitution, Crewe Alexandra. Chris Atkinson replaces Bradden Inman. Attempt saved. Oliver Turton (Crewe Alexandra) left footed shot from outside the box is saved in the centre of the goal. Marcus Haber (Crewe Alexandra) wins a free kick in the defensive half. Goal! Walsall 0, Crewe Alexandra 1. Adam Dugdale (Crewe Alexandra) left footed shot from the centre of the box to the bottom left corner. Assisted by Alan Tate. Corner, Crewe Alexandra. Conceded by Andy Butler. Substitution, Crewe Alexandra. Billy Waters replaces George Cooper. Substitution, Walsall. James Baxendale replaces Anthony Forde. Corner, Walsall. Conceded by Ben Garratt. Corner, Crewe Alexandra. Conceded by Andy Taylor. Oliver Turton (Crewe Alexandra) is shown the yellow card. Attempt saved. Jordan Cook (Walsall) header from the centre of the box is saved in the centre of the goal. Substitution, Crewe Alexandra. Marcus Haber replaces Febian Brandy. Corner, Crewe Alexandra. Conceded by James Chambers. Attempt saved. Greg Leigh (Crewe Alexandra) right footed shot from the left side of the box is saved in the top centre of the goal. Attempt saved. Bradden Inman (Crewe Alexandra) right footed shot from the left side of the six yard box is saved in the bottom right corner. Substitution, Walsall. Mathieu Manset replaces Malvind Benning. Attempt blocked. Malvind Benning (Walsall) left footed shot from outside the box is blocked. George Cooper (Crewe Alexandra) is shown the yellow card. Andy Taylor (Walsall) wins a free kick on the right wing. Foul by George Cooper (Crewe Alexandra). Corner, Walsall. Conceded by Adam Dugdale. Romaine Sawyers (Walsall) wins a free kick in the defensive half. Foul by Febian Brandy (Crewe Alexandra). Attempt missed. Romaine Sawyers (Walsall) right footed shot from outside the box misses to the right. Attempt saved. Oliver Turton (Crewe Alexandra) right footed shot from outside the box is saved in the top centre of the goal.